Premier Tickets Australia is proud to be the online ticketing partner for Rang Rangeela Gujjubhai – Gujarati Comedy Drama on 17th June 2017 at the Dame Roma Mitchell Centre. Contact us for any of your ticketing & marketing needs. Premier Tickets is an online event marketing and ticketing agency. 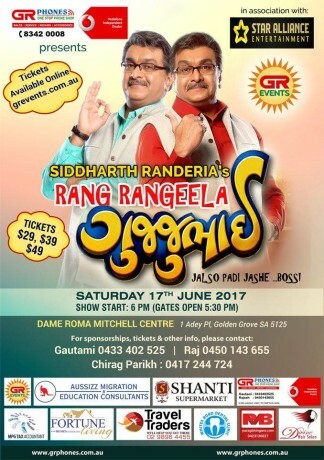 Premier Tickets will NOT be responsible for any changes related to the event schedule, artist, venue or cancellation and refunds related to the tickets for Rang Rangeela Gujjubhai - Gujarati Comedy Drama .